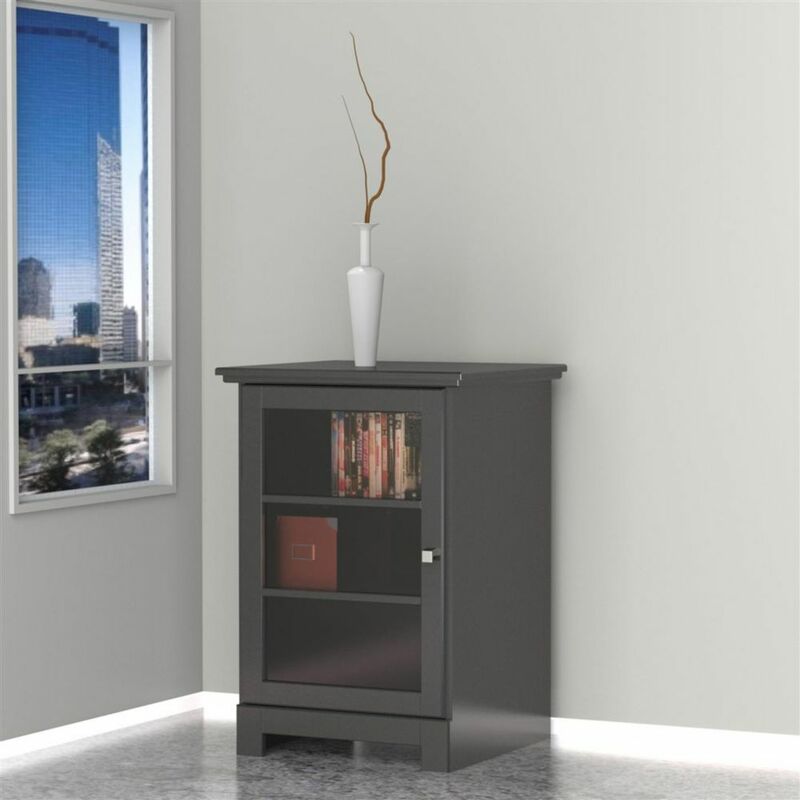 Pinnacle 1-Door Audio Tower in black textured lacquer and melamine features 2 adjustable shelves and 1 reversible door opening from either right or left. Add this Pinnacle Audio Tower to a matching Pinnacle TV Stand #101306 or #101606 to create a complete entertainment set. The Pinnacle Collection from Nexera offers a wide selection of TV stands and audio towers of different finishes and designs so you can organize your entertainment area in style and simplicity. Within a compact space, choosing the right pieces of furniture is crucial in order to feel relaxed and comfortable. Maximize every square foot of your room with Bestar's Small Space units! This set includes one 53.5-inch TV Stand and one 20-inch Storage Tower. 53.5-inch TV Stand: 53.5 inch W x 14.5 inch D x 15.1 inch H. Durable commercial grade top surface with melamine finish that resists scratches, stains and burns. 3 open compartments to keep you organized. 1 closed compartment with 1 adjustable shelf and 2 grommets for efficient wire management. 20-inch Storage Tower: 20 inch W x 14.5 inch D x 71.1 inch H. It features 2 fixed and 3 adjustable shelves. The top and the bottom shelves are fixed. The doors can be installed between 2 of the 3 adjustable shelves for a unique design. Assembly Required. The Damask entertainment collection from Nexera is distinguished by its clean modern lines, high-end designer look and contrasting volumes. The Damask audio tower features 2 closed storage sections as well as open shelf space for components, turntable, vinyl records and decorative pieces. Tuck away movie-night essentials or add your favorite potted plants to create a modern yet cozy look in the open shelf areas with this trendy & minimalist Galleri Collection. The front drawer & door panels have a modern twist with a linear construction detail that brings timeless depth and texture in a matte black lacquer finish. Ideal for movie marathon essentials or for your favorite potted plants, this audio tower with its modern yet cozy look is the perfect addition to your trendy & minimalist living room. This Marble collection audio tower offers open shelf areas and a door at the bottom for additionnal storage space. The door panel has a modern twist with a linear construction detail that brings timeless depth and texture in a matte white lacquer finish. Pinnacle 1-Door Audio Tower - Black Pinnacle 1-Door Audio Tower in black textured lacquer and melamine features 2 adjustable shelves and 1 reversible door opening from either right or left. Add this Pinnacle Audio Tower to a matching Pinnacle TV Stand #101306 or #101606 to create a complete entertainment set. The Pinnacle Collection from Nexera offers a wide selection of TV stands and audio towers of different finishes and designs so you can organize your entertainment area in style and simplicity. Pinnacle 1-Door Audio Tower - Black is rated 5.0 out of 5 by 1. Rated 5 out of 5 by Marius from Great thing I am so happy I bought that item. it was easy to assembly, looks good and I really like it.